Dealing with Pakistan’s export of terror is difficult enough for India. Add to this tragedy a third player, China, which not only backs Pakistan but even plays nasty economic games against India, and then it’s quite a tough job to handle. That’s what Prime Minister Narendra Modi must remember as he hosts the summit of the five-nation Brics and a retreat for the leaders of the seven-nation Bimstec this weekend in Goa. Pakistan is part of neither Brics nor Bimstec but will be at the back of Modi’s mind when he talks to President Xi Jinping of China in Goa. India must reconcile to the fact that, in foreseeable future, both Pakistan and China will continue to be its adversaries. Having already made enough gullible attempts to turn both those countries into friends, India must now begin to find ways to “manage” its relations with the rogue country on the west and its ally on the east in a manner that would be to its best advantage. India’s recipe to fight China must have more of economics than diplomacy. Then as a spin-off, India can hope for a more sober Pakistan, though there is no guarantee of that since nobody knows who is — and who will be, in future — in charge of Pakistan’s affairs. What makes the cash route a better bet to fight China is the slow-down in China’s economy. The dragon is breathing less economic fire now, and though it’s not ready to have its wings clipped, it’s more vulnerable than ever before. But it would take only a fool or a jingoist to believe that India is better off than China. Though India’s economy is showing impressive signs of improvement, Chinese economy, even with its present mess, is still many times larger than India’s, and the Chinese military much stronger. It’s also preposterous to even suggest that India must curb trade ties with China, in retaliation for the latter’s brazen backing for Pakistan. Economically, India needs China as much as China does India. Western economists differ on whether China’s economic troubles are subsiding, and their assessments are not proving to be reliable. Yet the stories that continue to come out of China of job losses, unemployment and salary cuts are good news for India. That’s what India must leverage to perk up its own economy and to bring down its own unemployment and poverty levels, say some well-meaning experts. Like India has replied to Pakistan’s terror in its own langue with surgical strikes, India must deal with China by employing the same methodology of chicanery that the eastern neighbour has made itself notorious for: by dropping a subtle hint here and there, and by making it clear that India will do business with China on its own terms. Brics is a good place to start, and China is already getting the right message not only from India but other countries of the bloc as well. Media reports suggest that India, along with other Brics members, are showing no interest in a “Brics Free Trade Agreement” that China wants to peddle to them at this week’s summit. This proposal is designed in a way to further China’s own interests, not anybody else’s. Paying for its past follies, China is indeed a desperate nation today. AFP reported on 10 October that China’s foreign exchange reserves, the largest in the world, have fallen to a five-year-low to less than US $3.18 trillion this week. But India’s reserves — $371.2 billion this week, though a fraction of China’s—are showing an upward trend. But that’s not the point. What matters more is what the world thinks of the Chinese and what India should do to rein the Communist nation that has no respect for international rule of law, human rights, treaties or the global fight against terrorism, and for whom transparency is a dirty word. But even China—where most things are shrouded in a sinister secrecy and where the very composition of its foreign reserves itself is a state secret—can occasionally be candid. That, again, perhaps is part of the Chinese passion to surprise the enemy. On 5 October, a Xinhua report quoted a Chinese official as having made an oblique confession that the world at large thinks of the Chinese as fraudsters who are unreliable to do business with. In the last eight months, he admitted, 20 countries including the US launched 85 “trade remedy probes” against Chinese deals worth US $ 10.3 billion, almost double the amount for the same period last year. These relate to patent or trademark infringement, misappropriation of trade secrets, false advertising and violation of antitrust laws. The Chinese are learning, though slowly, that their policies could one day lead to their isolation in the world. Already, China finds itself to be somewhat of a pariah within Brics, though not to the same extent as Pakistan is in Saarc — yet. 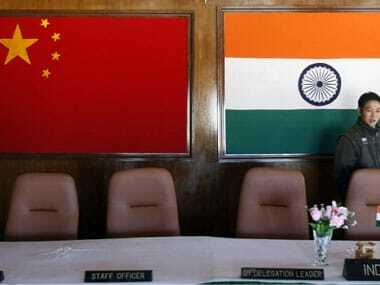 Among Brics members, India suffers from a trade deficit of $ 52.7 billion with China. This means China’s exports to India far outstrip its imports from India. Russia has its own $-12-billion trade deficit with China. Though Brazil and South Africa enjoy trade surpluses with China, all four countries are suspicious of any move that China makes that they think can even remotely affect the balance unfairly. Pakistan may be a vassal state of China, but Brazil, Russia, India and South Africa are not. They would be ready to call China’s economic bluff, though the four countries together don’t present a pretty picture of unity themselves. The way to grapple with the China problem lies in both politics and economics in right proportions. While using its own significant economic clout, India must raise its voice against China’s hypocritical and hegemonistc advances in the region. It is clear that, whatever Modi does or says in Goa this week, a meek surrender to the Chinese blackmail is not an option. The days of Jawaharlal Nehru’s gullible Hindi-Chini bhai bhai are long gone. Having called Pakistan’s bluff, India must now call China’s.